You can now organize your content better with our Custom Panel widget. 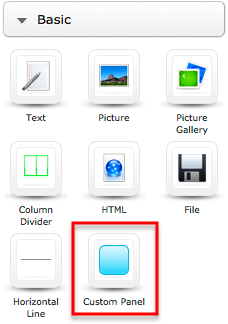 The widget works in a similar way to the Column Divider widget, you can use it to create a container on your page and then place other widgets inside it. You can find the Custom Panel widget in the Basic widget category. Drag the widget to where you would like your panel; it will then open up a dialog where you can customize your panel. On the first tab you can choose one of the preset colors, you can see what your panel will look like in the preview section. The background and gradient color* – Choose a color from the color chart or type in the hex color if you know what it is. You can even upload your own background image and choose the direction of the gradient! Border – Choose the color of your border, the style (dotted or straight line) and even the thickness. Corners* – You can add round corners to your panel and choose how rounded they – you can even make one corner more rounded than another. Shadow* – Use the sliders to add shadows to your panels. You can add them to the inside or outside of the panel and select the color of the shadow, the opacity and the width of it. Spacing – You can edit the space inside your panel i.e. create space around text within the panel or you can edit the space outside your panel by creating a margin around it. Fonts – Here you can change the type of font in your panel, the size and different colors for the heading, font, link or link hover text. When you add the Text widget into your panel, these font selections will automatically apply. *Please note, these features are not supported by Internet Explorer. We suggest that you upgrade to Google Chrome or Firefox in order to make use of these. Just like your house, containers on your website can help keep things neat. Use Custom Panel widget to present your content and to call attention to information on your site that you think your visitors will find helpful. Here’s a great example of the Custom Panel widget is being used effectively.